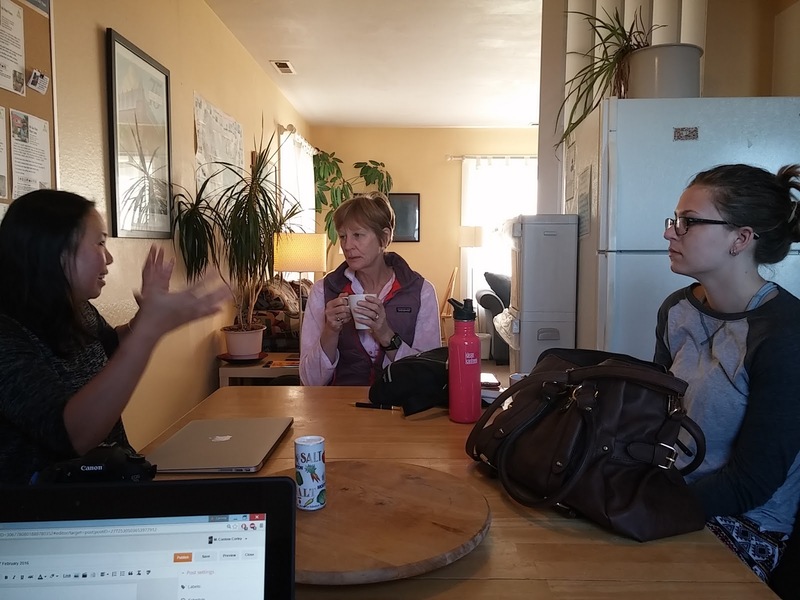 I sit in a kitchen in the Dolphin building at Pigeon Point Lighthouse hostel. A mother and daughter drink coffee at one end while I write. Beside them, at their end, a woman with lovely black hair and a marvelous Canon talks about the photography camp that she's been attending. This scenario evokes the deepest contentment in my breast. When you ask why I stay at hostels, this is the "why" of it; not the low cost, or the quiet, or the ability to cook my own food though all of those appeal to me. But I stay at hostels for the people. I lay in bed last night contemplating the events of Friday, listening the gentle snoring from someone in the bunk above me. I had gotten lost in a fog bank on Hawk Point above Marin Headlands. I maneuvered the one way road at fifteen miles per hour, terrified. I did not intend to climb the hill; I just wanted to take the coastal route back to San Francisco. I finished the round back at the hostel and headed for the tunnel on Bunker Road and back to the city and the Nineteenth Street exit which put me on California Highway 1. With the ocean to my right I drove south, first to Pacifica where I had breakfast. The owner of the cafe told a tender tale of buying mugs with large handles in order to always accommodate people with arthritis in honor of his father. I drank coffee and thought about fathers. And brothers. I tried to ignore the pain in my legs, breathing in the heady scent of the sea, taking the air deep within me and letting it ease the tension. My brother Frank's face rose in my mind. But not my brother the father of seven, grandfather of two. My brother the nine year old standing in the doorway of the front bedroom in our childhood home. I lie in bed, twelve years old, suffering my first bout of dysmenorrhoric menstrual cramps. My brother does not understand why I cannot do the dishes. He knows my turn to wash has come; he's stamping his feet and accusing me of faking so that he will have to do my chore. She does not LOOK sick, he insists. My mother does not know what to say. Close the door! I snap. I cannot believe the pain. I waken to a gentle tap on the door. What do you want, I groan. The old walnut door creaks as it swings forward. Through the gloom, I see Frank standing in the doorway, backlit by the soft light of the hallway. I brought you something, he whispers, stepping forward with a tray. I scrunch forward and prop a pillow against the wall. My brother settles the tray across my legs and I see that he has brought a plate of vanilla wafers, a cup of hot tea, and the Sunday comics. Now the sun rises over the waves which crash against the shore. The tension has drained from my body with a night of sleep. I still feel a lingering anger at whoever stole the shawl from the front seat of my rental car and the billing officer from Stanford who waited until the Friday before my Monday appointments to tell me that one setting of testing has not been approved by my insurance company. But with the night's passing, these seem less grim, less hopeless. I realize that Brenda, who gave me the shawl, will not blame me. I know that the one test which has been disapproved for payment can be done in Kansas City and the results sent back to Stanford. Still I mourn the chance to sit beside the ocean wrapped in that beautiful shawl. The cramps which wracked me at age twelve prompted that first Darvon prescription, my first step on the long slippery slope to dependence and addiction. I once wrote a poem about those vanilla wafers that my brother carefully arranged on a purple Melamac plate. I still have those plates; I claimed them when we divided my parents' belongings. Every once in a while, when the pain claims me, I put a little pile of cookies on one of those plates and eat them slowly, with a cup of tea, and think about home. 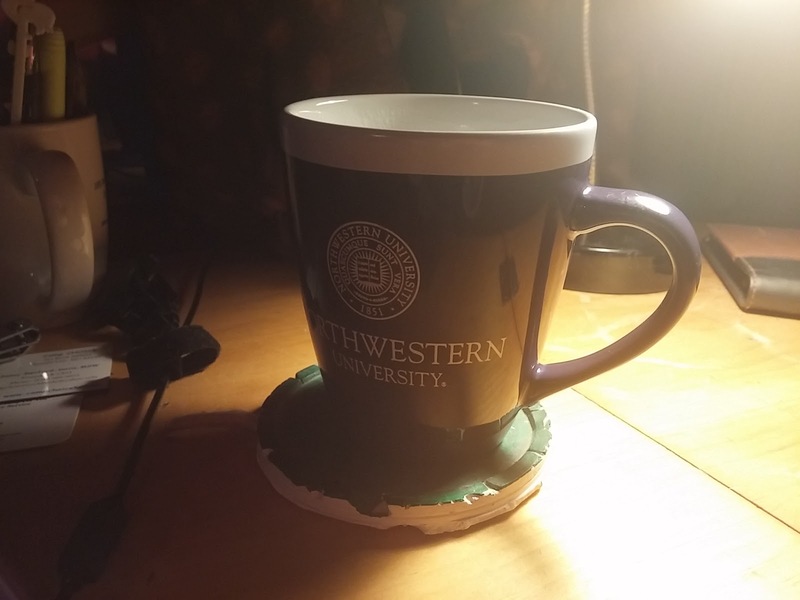 I always have a cup of something warm at hand, and today coffee sits in one of my collegiate collection mugs, on the little clay disk that Patrick made in his pre-school days. The sun has not yet risen. The dog still sleeps. Are you ever worried that your dizziness will cause other people to think you are intoxicated? A montage of painful memories clutters my mind. Not my dizziness, I said, outloud, to the empty room. Not that. Not that. I am walking across St. Louis University's campus, eighteen years old, under a waist-length sheath of knotted curly hair, wearing frayed bell-bottom blue jeans and an army jacket. My stomach knotted, my heart pounding. I had not anticipated the size of the place, nor the hordes of students, the rushing bicycles and blaring radios. Toto, I have a feeling we're not in Kansas anymore. Other than short trips to rural Illinois, I had only left Jennings, my hometown, twice before my college days. I had taken the train to Washington, DC to visit my sister, and I had flown out to Denver for the same purpose during the week of the McGovern election in the fall of 1972. Even being driven to the wrong DC quadrant by an unscrupulous cab driver late at night did not prepare me for walking across a crowded college campus. In the days which followed that first frantic encounter with the underbelly of academic life, I learned to walk with my head down, watching my feet, clutching my notebooks. In the warm autumn days, the quad teemed with groups of students. They flopped on the ground, flipped skateboards on the sidewalk, and drilled Frisbees through the air. I stumbled past all of them, from dorm to lecture hall, from the parking lot to the Student Union. My progress yielded not the catcalls bestowed on other females but disgusted muttering. Watch it, someone would bark at me, as they rambled down the sidewalk, swinging a heavy satchel. Get out of the way, would you? came to me from a swiftly moving bike. I dodged and darted. Sometimes I fell. Often I fell. No one leaned down to lift me from the ground in those days before being disabled got some measure of coolness, the days before the ADA. Are you drunk? The most-asked question, despite the time of day. Professors, grad students, my contemporaries, maintenance workers. I never bothered to tell them that when I was drunk, I never walked anywhere. I just slid further down in my chair and grinned at whoever sat nearest. I had not really dated in high school, not in the way of my classmates. I had a couple of boyfriends who had been friends of my brothers. But I had not "gone to Prom", nor worn somebody's senior ring or letter jacket, signs of the time showing you were no longer single. I did not expect much more from college. I had not changed; I understood that most folks don't like to date people like me. But one person did, and I greedily accepted his invitation. He came to get me -- driving from his family's home in Webster Groves all the way into the city in his Gremlin. A block from campus, an Oldsmobile ran a stop sign and slammed itself into the passenger door. An hour later, clinging to a fireman, I listened as the jaws of life wrenched me free of the gnarled metal that had been the little car in which we rode. In the following weeks, I learned to walk with a new twist, a dislocated hip. My guardian angel had cloaked me in her protective arms and I had escaped any other injury. But oh, that hip! It popped out of joint with a dogged capriciousness that defied prediction. I'm walking down the hallway of my dormitory. It's midnight. I've just come upstairs from the vending machine in the lobby. I carry a diet Coke and a Snickers bar. Protein and Caffeine, I called the snack, when I walked back into the lobby of the women's dorm beyond the security guard. He smiled and went back to his book, a work-study student putting himself through college guarding girls who defied his presence by sneaking their boyfriends through the basement windows. I take the elevator to the second floor and start walking to my room. Suddenly I am down, staggering against the wall. The can of soda skitters down the carpet, coming to a halt against a closed door. I hear the echo of the thud and then silence. My situation seems hopeless. I lean against the wall and close my eyes, waiting for the long shudder of pain to subside. I listen for signs of life, of other girls coming from their evenings at the library or in the boys' dorm on the other side of the lobby, or one of the floors of co-ed housing in the tall building in-between. But no one comes for a long, long time and I begin to cry. Just then a group of girls rounds the corner and sees me. Oh thank God,I think, and call out to them, Can you help me? But they hurry into a room at the other end of the hall. I hear someone say, She's always drunk, just ignore her, and then, the hallway falls silent and empty. An hour goes by and I'm still there when the R.A. comes back to her room and finds me. She hoists me up and carries me into her room and calls the campus medics. She holds my hand while they load me on the stretcher, and followed in her car as the ambulance took me back to the very hospital where the firefighters and medics had rushed me after they freed me from the metal trap. That R.A. sat with me while the ER doc examined my X-Rays, wrote a prescription, and scribbled on my discharge papers. Then she took me back to the dorm and settled me into my room. We didn't have cell phones yet, but we all had phones in our room and she pulled mine on its long cord to sit on the floor beside me. Then she slipped away, just before dawn, just before the pain medication pulled me down into a delicious fog, an abyss from which I would not emerge for decades. Now the sun has risen and my duties call to me. Today we have a "closing reception" at my Suite for the artists whose work has shown there since December. I have laundry to do, and plans to make for tomorrow's Rotary workshop and my trip to California on Wednesday. I place the completed audiology questionnaire in the blue folder where I have print-outs of all the reservations for that trip. I drain the last of my coffee, and then, the day begins. I can see only one light from my window. It shines from the back of a grey house four dwellings north of my back yard. An old pine rises above that home, like the cedar that I finally allowed myself to be persuaded to have removed from my side yard. I miss that cedar. The holly bushes planted in its place shed no debris but do not tower; they do not shade my upper story; they do not even seem to be thriving. I found small pleasures this week. A trio of apps from my favorite Pakistani restaurant for dinner one night; a spontaneous friendly hug from a nervous client outside the cold courtroom where his wife sat and fumed; the snug warmth of the slippers which my son bought me for Christmas. I ordered a new hair stick for myself from Amazon Prime -- buffalo horn, translucent at the ends, creamy and dark. The low cost surprise me. It came in a box, with a note attesting to its genuineness and instructing how to tell the difference between horn and plastic, as though I would take a heated pin and poke the side of the thing just to ensure that I wisely spent my eight dollars. I used to have four fat copper hair pins, three inches long with thick prongs. My mother gave them to me. She said they had been given to her by my father's mother, and had originally belonged to my great-grandmother Corinne. I don't know if she spoke the truth but I believed her. I have no reason to think otherwise. I had crazy long hair for most of my life. I had someone cut it to protest my mother's decision to make me wear orthopoedic shoes in eighth grade. When she cried over my short ragged hair, I spat bitterness at her: If I am going to be ugly, I might as well be ugly all the way. I had paid eight dollars for the hair cut. She paid ten more to have another shop make it look decent. I cut my hair again when I finished college and moved to Boston. I painted blonde streaks with a kit from the drug store. The new roommates that I found in Brighton, down the Green Line by BC, thought I was gay; they thought their boyfriends would not be tempted by me. They had nothing to fear but not for the reasons they assumed. I ended up dating the only man among them who hid his own true nature. We stayed up all night every night for a week scheming how he could tell his mother and father. I helped him make a plan to come out. I left town a few months later, with shoulder-length hair, faded blonde streaks, and the knowledge that I had succeeded at only one thing in seven months: Helping someone claim his homosexuality. Twelve years, one-and-a-half degrees, three cities, a marriage and a divorce later, my hair had reached my waist. By that time, I had escaped from Newton County, Arkansas, where the marriage had failed on the horns of our emotional immaturity. I lived in Winslow, practiced ag-law with a radical firm, and twisted my hair into a French chignon for court appearances, securing it with my mother's copper hair pins. I drove from Fayetteville to Springfield, Missouri in the dead of the winter of 1989 to defend a local cattle rancher in bankruptcy court. My two instructions from the head of my firm: Don't talk to the local press, and don't let that judge push you around. We knew the federal indictment would soon be made public. My mission that day involved protecting the fees paid to my law firm from recapture into the client's bankruptcy estate. My client's original local attorney had gone over to the government's side. I would be cross-examining him and his female partner. My client drove us both to the federal courthouse. A half-dozen marshals waited by the metal detector. They made my client take off his cowboy boots, the heavy-buckled belt, and his leather jacket. The Oklahoma City bombing would not occur for five and a half years; 9/11 could not even have been imagined. But that courthouse and those U. S. Marshals had prepared for an old cattle rancher accused of selling cows out of PCA trust and his five-foot-three, hundred-pound lady lawyer. When my turn came, the machine through which I walked bleated in wild and accusatory tones. I wore no belt. 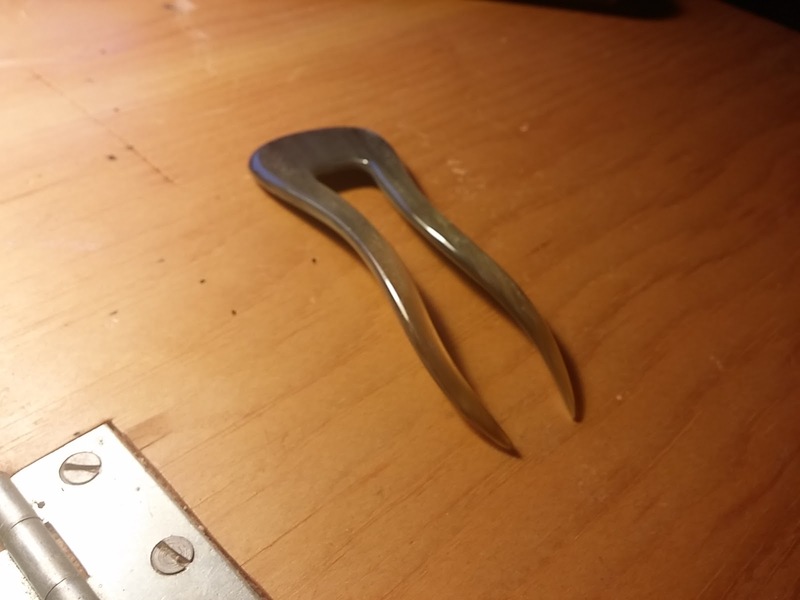 I had metal in my knee which they wanded. A gruff-voiced female officer said, It's not her knee, and made me take off my shoes, watching as I struggled to untie them with no where to sit. They put my brogues through the X-Ray conveyor belt while I stood shoeless on the cold floor. Then they gestured me to walk back under the detector's arch. I came around, ignoring the two officers who had taken everything out of my trial bag and my pocketbook, strewing the contents of both across a table. But one of them said, Wait, what's this? and held up the four-inch crescent wrench that my erstwhile husband had given me, a year or two ago, to tighten the nut on my windshield wiper. My stomach lurched. It's a weapon, that's what it is, his buddy replied. I had grown weary of this game. My client started forward from the wide stretch of floor beyond the security station. I gestured him to stand down. I explained why I carried the little tool. They confiscated it and told me to go through the metal detector again. When I did, the alarm sounded and then I remembered my hair pins. I thought, does copper set off metal detectors? about the time that one of the female officers said, I bet she's got something hid in that bun of hers. We were due in court in about ten minutes. I frantically pulled the pins from my hair while my client started shoving my files back into the bag and my personal things into my purse. One more pass through the detector, with my hair spilling down over my coat, bare foot, seething, and they let me go. I grabbed my shoes and we ran for the elevator. They kept my grandmother's hair pins and the little crescent wrench. I went back after the hearing but nobody knew where they were. I followed the news about the occupation of the Malheur National Wildlife Refuge in Harney County, Oregon, and the stand-off between an anti-government militia group and U.S. local and federal law enforcement agencies. I did not agree with what the occupiers demanded. I would not have chosen their method of protest. But as I sit here, seeing my reflection in the old wooden make-up mirror, with my hair held by the buffalo horn hair stick, I yearn for those copper hair pins, which my mother once touched, and my father's mother once used; and which federal marshals confiscated and kept, so many years ago. The sun lightened the sky as I sat drinking tea, eating toast, and scrolling through e-mail. Now morning overtakes my neighborhood. I can see clear down the block behind me, Charlotte Street, maybe seven or eight houses north. The pattern of home varies little through the row. One has a back awning, another stands behind a new picket fence. The gabled roof of one faces vertical; of the next, horizontal. But otherwise the houses echo each other, and mine, in this few square blocks of bungalows. A notice from "The Facebook" tells me that the latest craze in dolls presents little feminine replicas of disabled children. I find this ironic. Row after row of comments praise this development but I'm skeptical. All my life, I've wanted to be able-bodied. I understand the yearnings of a small girl, gazing at perfect dolls, wishing to be like them. I can't imagine wanting a doll that looks like me, with crooked legs that barely work. Will she come with her own InRatio machine? A set of orders for monthly labs? Please. 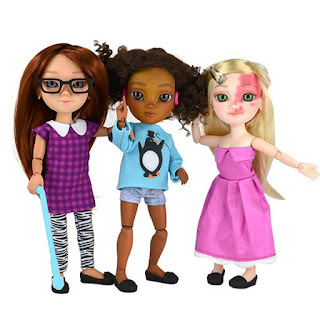 Still, I applaud these companies to the extent that they have given little girls someone "Just Like Me"; I'm glad for the girls, the ones with the walkers, the wheelchairs, and the cochlear implants. I'd be even more glad if children who didn't have disabilities bought and played with them. I'd crow if nobody noticed the differences between us -- or, God forbid, celebrated the diversity. I saw a commercial for Barbie-dolls with different waist sizes. That's fine, as long as little girls don't buy them and role-play attending a Weight Watchers meeting. Maybe I'm showing my age. Maybe my patience wears thin. The three-story law school which I attended had a private elevator for staff. I struggled on the stairwell for three months before someone intervened. I fell three times carrying an armload of books and no one helped me. They all trundled past, rushing to class, averting their eyes. Law students! Finally one of the professors saw me out of breath and disheveled as I entered his lecture hall and took me aside. He explained about the keyed elevator which only professors and staff could use, but that our classmate in a wheelchair had been given a key, and he thought that I would qualify. That was Professor Crandle, who taught contracts. He called on me every blessed day. When I asked why, he said, Because I know you are always prepared. I told him, Well not any more, I won't be! He laughed. Now I will call on you every day just to make sure you KEEP preparing. I've typed his name three times, trying to remember how to spell it. He took me to the office and handed me to the assistant dean, who issued an elevator key to me. Only two of my classmates questioned my special status. One, who shall not here be named, followed me to the elevator one day. She said, How come you get to use the elevator? I told her, The stairs are hard for me. She rolled her blue eyes, tossed her blond hair back on her shoulders. Well you don't look too bad off to me. When the doors opened, she trounced past me. As I walked to class, I recalled that she had enrolled in "the 90 hour program". Technically this would have been her fourth year of college. She's still young, I told myself. She's never had to struggle; she doesn't know what it's like. Halfway through the first semester of my second year, another classmate asked if she could ride the elevator with me. I'm so tired, she explained. I knew she had three children and no husband, on the heels of a divorce. It stood to reason that she might be too tired to climb the stairs. I would have let her follow me anyway; I liked her. We got on the elevator and I activated the keybox. She said, this is really nice, I wish I could have your key, you're really lucky! I felt that knot in my stomach which sometimes precedes a struggle to be courteous. She continued. I wish I got special treatment like you. There. Breathe, I told myself. Just breathe. I did not mention that I knew she had been on academic probation for our first year; that she had a terrible college GPA and substandard admission test scores. She had gotten special treatment. Two other students, with better grades, had been released from our class at the end of first year. We got to the third floor and I stepped aside to let her exit. I had managed to keep smiling. But in parting she turned and said, Pretty nice deal you got for yourself, and my determination snapped. I tell you what, I answered, using her name. You take the key, and you take what got me the key: The pain, the falling, the ugly shoes, the fatigue, people's stares, and every damn part of it. Take it the key but take it all. Just take it, I'd love to be rid of the burden. I don't know about disabled kids today. Are they taught that their disabilities just count as another physical trait? Blue eyes, red hair, twisted legs? Or do they hesitate, say, You know I walk funny right? Is that okay? As I do. As I feel I must. Otherwise, I am taken to task. Why didn't you tell me? What about today's kids who don't have hearing impairments, or Down's Syndrome, or Aspergers? Do they feel superior? Experience pity, as my generation did and still does, if what they articulate to me is any judge? Or do they consider those "disabilities" to be "normal" -- like one's shoe size? I've had people tell me: I thought it about; I decided I don't mind if you're disabled. I guess I'm supposed to be grateful. I feel like saying, I've thought about it, and I very much mind that you're so arrogant as to think you have to give me permission to walk funny in your presence. I know that I still get stares. I still have people describe my limp before they describe my smile. Someone whom I love dearly once warned others who would be meeting me that I had "a gimp in [my] getalong". I nearly vomited when I heard this. What about my caring nature? My wildly curly hair? My great writing? Why did you feel it necessary to warn people that I limp? Just a half-dozen years ago, this was. Not last century. Not 1950. Don't be startled by the way she walks. Don't gasp. I pity today's disabled children, if the adults their friends will become feel compelled to warn others about them. Guess who's coming to dinner. Maybe they will use old "Just Like Me" dolls to illustrate. So I ask again, Will able-bodied children play with these dolls? And not play "hospital", but play going to the prom, getting married, "house". Nothing that has to be specially scripted. Just Like Me. The neighbor's dog barks to be let into the house. He's a little eponymous miniature poodle. Scott and George, the married couple who own him, sometimes get his curly coat of hair chalked. He looks adorable with a shock of orange. I see one of them open the back door and let Poodle into the house. The sun has fully risen now; a gentle blue settles over our block. Two houses north, a pile of cinder blocks stands against the fence. I have not noticed it before. I wonder if the new neighbors will be building a shed. If they start now, it could be finished by spring.